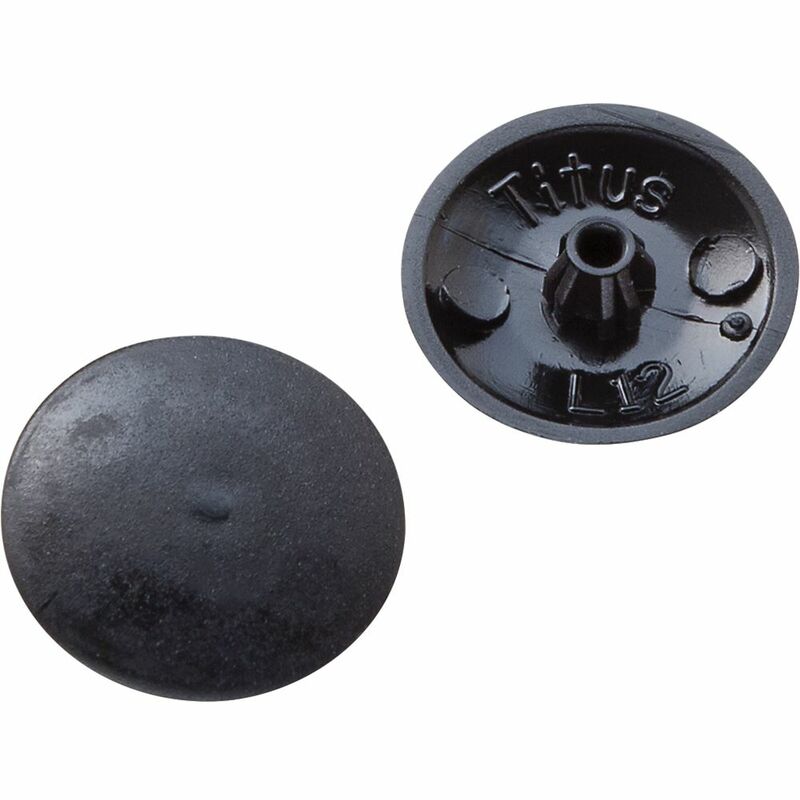 These plastic cap covers hide screw heads from view. Easy to use-- just pop into place! Friction fit. 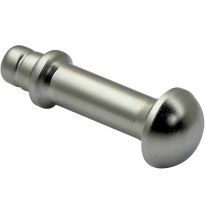 Available for #2 Square drive screws , or for Phillips and Square-X screws. 1/2" diameter. Crowned head (with a 1/16" raise). I went to 4 different stores in my city while looking for brown cap screws and after no luck, I was happy to find them through Rockler. They shipped them fast and they work perfectly. Thank you! Rapid fulfillment of order. Shipped and received in no time ! Thank you . Order met and surpased expectations! I'm using them to cover the screws that attach old iron sconces to the wall. They cover the screws perfectly and they look like real iron! 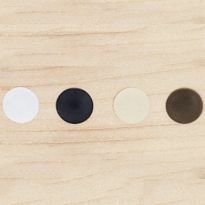 A neat, clean method to cover screw heads in finished melamine. Hi. I used caps when I redone plastic brick mold on garage doors and windows on my house. I used phillip screws to attach molding. Put caps to cover screw heads. little glue and the look great. They are darker in real life than the picture shows but the will work. I really only needed a dozen but the package of 100 was just as cheap. You really need a color about half to two-third in shade. I think a little stain will do the trick. Met my needs very well. I glued them on as they did not fit with the screws that I had used but they covered the holes and gave a finished look. The screw covers would not stay in the screw heads, but a little dab of glue fixed that. The part that engages the Phillips head needs to be a bit larger to cure this problem. Did not fit a #2 phillips head, falls out.. I fund that the insets were not firm enough to provide an even hold on the screw head. The cover would many times either bend off to one side or hold at an angle so that the cover would not lay flat against the substrate. I would not use this product again. If the screw is sunk flush the caps will not work. The screws need to be slightly above the surface. Not good if you need your screws to hold tightly. Useless. Fall out if you look at them. I bought 2 packs of these and they just fell off of the Rockler square head screws. The screw cap covers did not fit the slots in my square x screws. Had to glue them on to the wood with super glue to hide the heads of the screws. 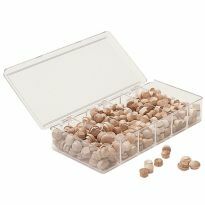 I will use white screw cap covers to cover the outside screws on a pantry cabinet I am building for the basement. looking for some plastic covers for my front door threshold. Having a hard time locating some. Thought these might work. Give it a try. To cover the screwheads on a wood chest I made my granddaugthers for Christmas. Lowes and Home Depot did not carry these. I needed to patch-up a coat rack installation that didn't go perfectly. I had a small stash of these buttons on hand, but in black. I could not find white buttons at my usual store, in fact I can't recall where the black buttons came from. I've ordered from you before and found that you have what I want. 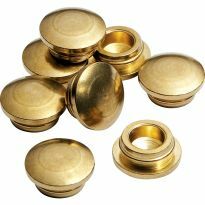 I have been looking for the screw cap covers in light brown. These will work perfectly! Bought these years ago and just now have been installing (and ran out). Amazing how well they hold, but were not easy to install until I put double stick tape on the end of a 1/2" x 6" dowel as a holder and tapped the end with a hammer to set them. Works great! To make my project more attractive by hiding the screws. Do the caps work with your Panel Connectors, Item #: 18350 ? BEST ANSWER: Yes they do------the problem I had was blending it in with the wood-----in my case I had white painted shelving and the white color was a bit off. They worked well enough to cover the connectors---but would have preferred a light adhesive on the back. Stephan, the panel connectors have a 3/8" head with slotted and phillips/square x. 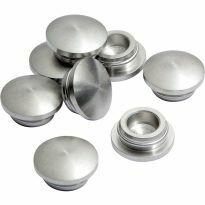 The screw cap covers are 1/2 " diameter and fit that screw head. what is the diameter of the cap? The plastic caps are 1/2" in diameter. 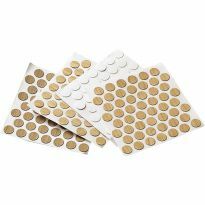 I do custom kitchen design and installation and prefer the flat caps with an adhesive backing. Hope this was helpful. The diameter is 1/2" (half inch). Any chance these would work with t star drive screws? BEST ANSWER: No, I don't think so. T-stars are a hexagonal format and these caps are designed for square or Philips sockets. I've found over time that there's about a 50/50 chance they're stay put in a Philips drywall type screw. I suppose that has as much to do with alignment during install, and screw depth, but I wasn't thrilled with the product. 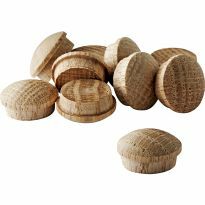 do you have any of these caps that are 0.75 inches in diameter? BEST ANSWER: These caps are not available in larger sizes. I'll be using a three inch Phillips head screw, will these cover? Will they work with a #3 phillips screw driver bit? BEST ANSWER: They'll work if you put a drop of epoxy or super glue gel in the slot.